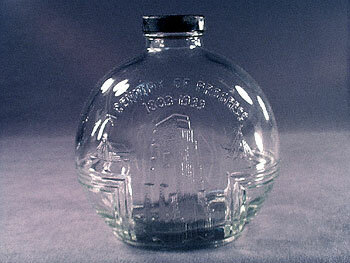 This great crystal clear glass bottle was designed to celebrate "A Century of Progress 1833 - 1933" for the 1933 Chicago World's Fair. Used to keep a quart of water chilled in the refrigerator or icebox, the terrific donut shaped bottle has embossed triple bevel lines with the magnificent General Motors Building in the center. A log cabin is on one side of the top of the building, with a teepee on the other side. We have darkened the picture purposely to try and show the detail as much as possible. Standing 6-1/4" tall and 6" side to side, this wonderful World's Fair souvenir bottle still has its original screw cap. Although there is surface rust on the black enameled metal cap, it is fully intact and quite remarkably, still has the original liner.